Organisms buried in sediment may decay or dissolve away leaving a cavity or mold. If the space is subsequently filled with sediment, an external cast can be made. Molds and casts are three dimensional and preserve the surface contours of the organism. A mold preserves a negative imprint of the surface, while a cast preserves the external form of the organism (Taylor, Taylor & Krings, 2009, p. 22). Sometimes a shell can be filled with minerals and then dissolve away. The internal cast that remains is termed a steinkern, which in German means "stone cast" (Pothero, 1998, p. 7). 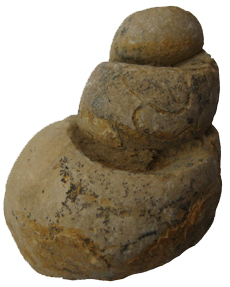 Steinkerns are most often represented by the internal molds of mollusks. The pith cast of Calamites is the most common plant steinkern. As a Calamites tree matured the center of the stem (pith) became hollow, developing into a tube-shaped air cavity. The pith cast preserves an impression of the pith cavities outside surface, which represents the inside vascular and cortex tissue (Taylor, Taylor & Kring, 2009, p. 23). Most molds and casts do not contain the actual remains of an organism. 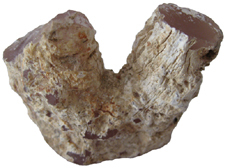 Shells, bone, and wood often form as molds or casts. 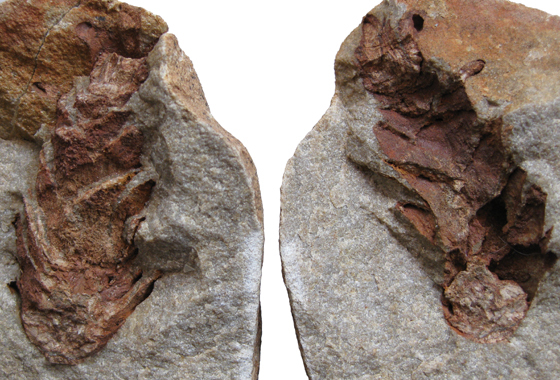 Some trace fossils (ichnofossils), such as tracks and burrows can form as casts or molds. Tracks and burrows can provide clues to the behavior and biomechanics of an organism while it was alive. 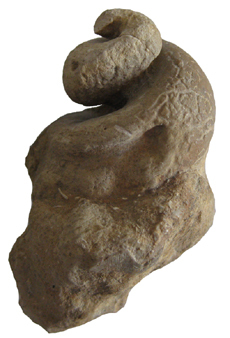 Concretions often encapsulate a fossil mold and cast. The siderite (iron carbonate) nodules of Mazon Creek, Illinois preserve Carboniferous aged animals and plants as molds and casts (Nudds & Selden, 2008, p. 120). It should be noted that some authors classify the fossils in Mazon Creek nodules as impressions (Janssen, 1979, p. 24; Rich, Rich, Fenton & Fenton, 1996 pp. 4-6). Limestone concretions in Ft. Collins, Colorado contain the molds and casts of Cretaceous aged mollusks. As kids, my friends and I collected multiple Inoceramus clams from a 3-foot diameter concretion. These fossils are found as molds and casts with the cast filling the mold. 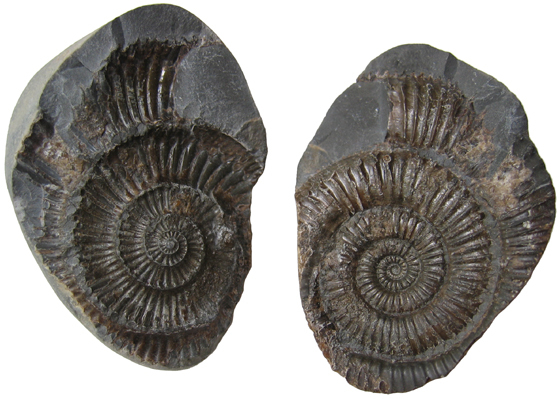 It is important to realize that many fossil specimens represent more than one mode of preservation. 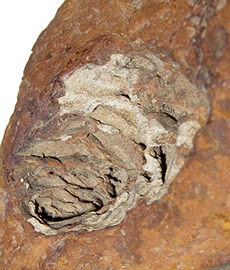 For example, the cast in a Mazon Creek nodule also represents fossilization by authigenic mineralization, a type of replacement. Subtle pH changes created by the decaying body of the buried organism caused available iron carbonate to precipitate. 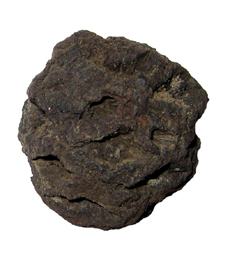 Thus, the organism became its own nucleation site for the formation of a siderite nodule. Some of the shells found in the limestone nodules of Ft. Collins retain altered shell material, which represents recrystallization. 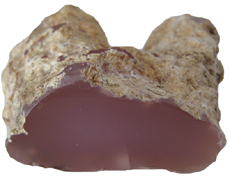 Aragonite (calcium carbonate) in the shell recrystallized to calcite, a more stable form of calcium carbonate. We usually think of casts and molds as exhibiting obvious three-dimensional character. The thin leaves of plants or the wings of insects can produce shallow casts and molds. Shallow casts and molds may take the form of imprints, or impressions, preserving the three dimensional character of an organism. 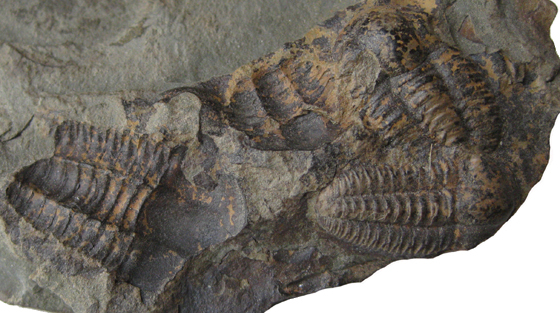 Impressions of wings are a common insect fossil. Even some of the relief, like pleating on the wings can be preserved. This is important because the veins on a wing can be used to key an insect to the family level (Grimaldi, D. & Engel, M.S., 2005, pp 42-45). Imprints, impressions and many trace fossils, such as, burrows, insect galleries, and tracks, may represent types of molds or casts if they retain their three-dimensional character. Molds and casts are important because they can faithfully replicate the external form of an organism in a three-dimensional fashion, giving the paleontologist information about surface anatomy.